I believe that our home is like our mind. It turns overwhelming after a while. Maybe because of passage of time or because of the limited capability of our brain to run in a thousand different directions, we end up stacking a lot of memories in boxes and forget them. Ditto for our home. But then sometimes, while staring at a drifting cloud or a bird going home, there are memories that rush back, memories that we had long forgotten, memories that surprise us because they are still unknowingly breathing inside us. It is a breathtaking moment when you wonder if a particular memory was actually a dream. And you ask yourself – Did it actually happen? I shifted home two years back. It was a painful experience. I had spent 25 years of my life in that house. The house has been a silent spectator of the emotions that everyone living in the house went through – bliss, heartache, gloom, love, togetherness, separation, marriage and death. The house was a member of the family; it was where everyone returned, where everyone found each other. While I packed my life to move to a new (and bigger) shelter, I stumbled upon memories stacked away and forgotten. I opened boxes to have a look into the piece of the past they contained and was transported back. 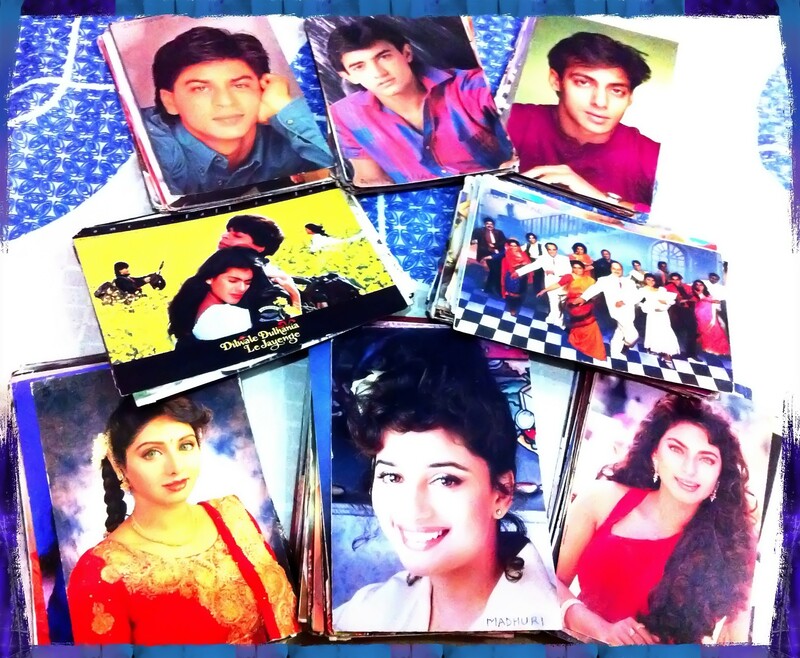 There were tears in my eyes when I fell upon a shoebox full of my collection of post-cards of Bollywood actors and actresses. Like every other teenager, I was madly in love with them. There was a shop that was a ten minutes walk from my home where a kind, obese uncle sat with his kind, obese son as I rummaged through the postcards for my picks. My family was not rich. My father was barely able to meet ends and so the importance of money was etched in my mind from childhood. But then I had hobbies. So, I collected every single rupee that was given to me. Every coin added to my piggybank was yet another step towards acquiring a postcard, towards buying a second-hand novel from the Sunday Daryaganj market, towards getting that cassette recorded with the latest Bollywood songs from the local music corner, towards buying the latest comic book of my favorite superhero, towards buying Filmfare and reading all that our stars had to say. There were times when I had to wait for days to accumulate sufficient amount to buy a dream but the wait was always worth it. My sister always wanted a Barbie – the new doll with wavy hair that had recently hit the market. She would look hungrily at the shiny dolls wearing glamorous clothes displayed in the windows of toy shops. Of course it was too expensive (Rs 100 a doll back then) and we could not afford it. The hair on her doll’s head was fewer in comparison and would come away after a few combs. I decided to make her happy. I took a nice, long needle and some spare wool (left from a hideous sweater that mom knitted for me) and started adding hair to her doll. I took off the head of the doll and pierced her head with the needle from inside. I then pulled it till the end of the wool and then snipped off the wool so that she now had a hair till her waist. I repeated it a hundred times and soon the doll had lush green woolen hair till her waist that my sister could comb to glory. When my sister saw Aishwarya Rai become Miss India, she had a sudden urge to host a Miss World in our house. I again came to her rescue leaving my Hot Wheels cars and my plastic animals behind. I drew a lot of lovely women on paper wearing exquisite gowns and sashes of their countries. I then cut them and made them stand by pasting a thin cardboard strip near their legs. I made around 200 such drawings and gave them to my sister to play. She made all of them stand on a table and gave them a number and chose the next Miss World. Oh! How she loved it! I found the lovely ladies in a box, lying on top of each other and smiling at me. I found truckload of capacitors and resistors that my father used while repairing our old television. He had done a course in electronics and I would gawk at his notes with that immaculate writing and the complicated circuit diagrams. I found those notes. I found Mom’s old black and white fairy photograph. When I came across the bag containing all the pictures, I desperately searched for her photo in which she was wearing a black pahari dress. As a child, I used to think that she was a fairy whenever I looked at that picture. I promised myself that I will get it framed. I found dad’s photograph in which he looked like Rakesh Roshan. I found my old sketch book about which I blogged here. I found a card with the picture of a village belle in the front and a sher written inside by my father. I found his wooden miniature airplane. I found my kindergarten report card. It was a beautiful day. The boxes that I had stacked away in my mind and completely forgotten were magically opened one by one. As the memories tumbled out, I thought that moving the house wasn’t a bad idea after all. It was refreshing. It took me to another era. It made me realize how much I have changed. It humbled me. But there was a nagging guilt that I was leaving the house behind. And then I felt as if my old house was smiling at me. “You are not leaving me behind. I am in all of those pictures. I am the wall behind you. I am the floor on which you stand. I am coming with you,” it said. Sometimes I pass that house and look at it from my car. Someone else is living there now. It is a part of another family. Does it still remember me? An emotional post indeed..Nice pictures of your parents.. It all seems like another life now. It was such a different time. Yes, the Miss World idea was kind of different, wasn’t it? I was really into painting, sketching and arts back then. You made me nostalgic, I have changed almost 6 houses till now (because my dad worked in the army) and I was attached to each one of them. And I can relate to that feeling when you pass by a place you once lived in…a house full of memories associated with each phase of your life, a place I was born, a place I spent my childhood in, a place I had my own room…. memories, they make us smile and cry at the same time. I have changed 4 houses but I had spent the longest time in the previous one. I hardly remember the rest of the changes. Even the thought of someone else living in that house now is repelling. If I had some extra money, I would have kept it. I have myself thrown a lot of my things which I regret now. My comic books are no more with me. That was the biggest mistake. The way prices are rising, I don’t think we will be capable of buying most of the things. Such a beautiful post! And your sister is blessed to have you for a brother.The efforts you made to see her happy…I can only say WOW!! And yes, it’s such a queer feeling to see the house you once occupied, to which so many memories will always be attached, being home to someone else. It is a strange feeling indeed. When I went back to my college to collect my degree, it was strange to see someone else living in my hostel room. So, seeing someone living in a house where I grew up was kind of revolting. You know, all these things are lying in the house but we hardly get time to go through them. I had thought so many times that one day I would take out time and go through them but I kept shifting it to the next week. We should all go through our past once in a while. It is worth it. Haha! I have posted a few on FB. Check in my photos section. Words fall short when it comes to nostalgia. A heartfelt trip down the memory lane. Yes, Alka. It was your post that inspired me to write this one. Sometimes words are not enough to express your feelings .. don’t have words jst remembering the old love and care which we shared in the past , the togetherness , the bonding , the love b/w a brother and a sister , god bless u bhai .. It was a different time. What crazy things we did! God bless you too crazy girl! I used to love rummaging through old photos, scrapbooks and mad things my sister and I had build, at least once a year. Like a British raj style “punkah” with rope and all, to be hung across the bedposts. We used to take turns to pull it, and non-pulling person could pretend to get some relief from the summer powercuts. Loved the things you made for your sister. The treatment of the doll alopecia problem was very innovative, I would like to go back in time to try it for my sister whose most dolls suffered from this ailment. Yes, we should all do the rummaging. It keeps you grounded. 🙂 That is what everyone tells me. I somehow never saw the resemblance but it must be there. About Madhuri, I guess you are attached to the stars whose movies you have seen during your teens. I was crazy about Sridevi, Madhuri and Juhi. Beautiful!! I have changed many houses and have carried some of my memorabilia with me. I have magazine cuttings of Albert Einstein’s childhood picture as well as Alice’s picture among them. In my diaries I have noted down wrongly attributed quotations from TOI. Now we can find such things on internet. I have thrown away a few of my things but I regret it now. I used to have a diary in which I wrote the names of all the novels I have read. I don’t have that diary anymore but now I have Goodreads. Yes, internet has changed a lot of things for good. The Miss World thing is way tooo cute!! All the memories of the older house are not good but while living in a house, you get used to the idea that this is going to be forever. So when a change happens, it hits you hard. Awwww…..you are such a sweet brother, Amit. I just loved the pics of the all the participants…how much time and effort you must have put in it. And your dad does look like Rakesh Roshan..and your mom is truly beautiful. For me, I never stayed in house for years together…:( The max was for 4 yrs where I had more memories of growing years from my 7th to 10th grade. It was a rental house, but then I felt really sad. I had an almirah where I pasted all my fav pics on the inside of the door. I felt really sad when leaving that home. And staying in a home for 25 yrs, woww…..I can imagine what it feels like.. I think I had loads of time back then. 🙂 I was very much into drawing and arts and crafts, so I used to take such assignments with great enthusiasm. Me too…after school and college, I never got back into drawing..except for doing stained glass now..that too with a hundred breaks. Such a lovely post and i can relate a lot with what you wrote. I too come from middle class family and how myself and my sister wished for a Barbie…..We sisters used to collect pictures of film stars and cricketers, one pic used to cost 10 – 25 ps. My mom still has those books in which we pasted those pics…..
You are such a lovely brother…..your sister is lucky to have you….. I was into Hot Wheels as a kid and loved them to bits. Of course they were too expensive and I hardly had 4 of them over a period of 10 years. I kept them even when they broke. 🙂 I wonder if the children of today’s generation go through such cravings. I am kirti ,a relatively new visitor to your blog, though I started following your blog asa I read a couple of posts in one go a few months back. I loved this post of yours.All along I was imagining my own old house where we (I stayed until got married) stayed . I felt as if you were speaking for me and my bro and my house. I found you a very sweet brother ,artist and all. Miss world thing was a great effort.It must have kept you and yr sis busy and preoccupied for days on . Wasn’t that a great blessing to be hooked off TV , video games and be busy in doing creative things? It was a different world back then – simpler and more fulfilling. And, yes, both your parents look so smart! Your mom does look like a fairy in that dress, and your dad does resemble Rakesh Roshan. BTW, very sweet of you to add hair to your sister’s doll and make cut-out Miss Indias for her. 🙂 Very cute! Thanks for liking the post TGND. 🙂 I too went through Geet’s childhood pictures some time back and had a great time. And about the postcard bit, I wanted to create a world record of sorts by collecting pictures of all the actors. I even have postcards of Mamta Kulkarni and Bhagyashree. This, my friend, has got to be the best piece of yours that I have read so far. ‘Soft as an easy chair, fresh as the morning air’ as the song goes. And also because it gives a glimpse into your kind, generous, simple heart. Oh no, Amit! Forgive me for saying this but half of it can pass as my story! I was moved by your act of adding hair to the pate of your sister’s doll and the hosting of a local Miss India contest. And that is where my reverie breaks. I was no such angel. A beautifully poignant trip down the memory lane. Wow, Amit…this transported me back to my days of the 90s and a similar incident that forced me to look down the memory lane with nostalgia back in 2002. Great read, very emotional! Thanks Kajal for liking the post. I think the 90s was such a different time than the last decade that anyone who lived through those two decades look back at the contrast with awe. Talk about being an awesome blogger! Discovering more dimensions to you than being a kickass blogger 🙂 Pleasantly surprised. Did you write this recently? Or is it an old post revamped? This is a new post. I wanted to write this since a long time. Yes, I went back in time to write this. I think I am fortunate that I have something in my past to go back to. Loved this post, Amit! I have shifted multiple houses right through childhood and even later so unlike you houses don’t have much meaning to me but people and memories certainly do. And such heartwarming memories that you put out. I loved this peek into your life. The pics of your parents are so wonderful. Even I have very few pics of my parents. And that Miss World thing is super cool! Brothers really do that? I would love to see the pics of our parents. I love all those black and white pics. The nostalgia of lovely memories is truly memorable! A beautiful post with so much treasure of bygone time! You are lucky if you have never changed your house. It is not a very nice exercise. Saying I loved this post would be an understatement. I loved drawing and painting, so I usually jumped at any chance of indulging in such activities. Really nostalgic Amit. It just brought back all the memories when I moved my house. Very nice post Amit…as always….and I absolutely loved those miss indias drawn with amazing detail….i wish my sis was so tuned to my needs as a child, and not the barbie spoiling kid that she was….really enjoyed the pics of ur parents as well…. Some of them were quite horrible but most of them came out alright. I was surprised to see that I actually colored them. I remembered them black and white. Sounds crazy, I know. Emotional. Nostalgic. Honest. Full of Brotherly love. And I loved it. I totally thought it was an old picture of Rakesh Roshan and your mom, she is so beautiful. And because of your dad’s picture and other postcards I assumed this to be a post on filmstars when it appeared on my reader, I started guessing the other black n white pic and it seemed the graceful Shweta Bacchan and then I thought why her pic would be b/w that made me to read the whole post only to realise it is your mom. Totally worth framing pics. Last time I went my maiden home, I did the same activity rummaging through old boxes and shed away some if the bad memories of past and preserve the good happy ones. I don’t know if I can call myself an artist. Lets say that there were other pressing issues like putting food on the table that made me give up painting. and your mom..sigh! she looks amazing eh? Yeah, Mom looks amazing in that photograph. There is so much innocence on her face. 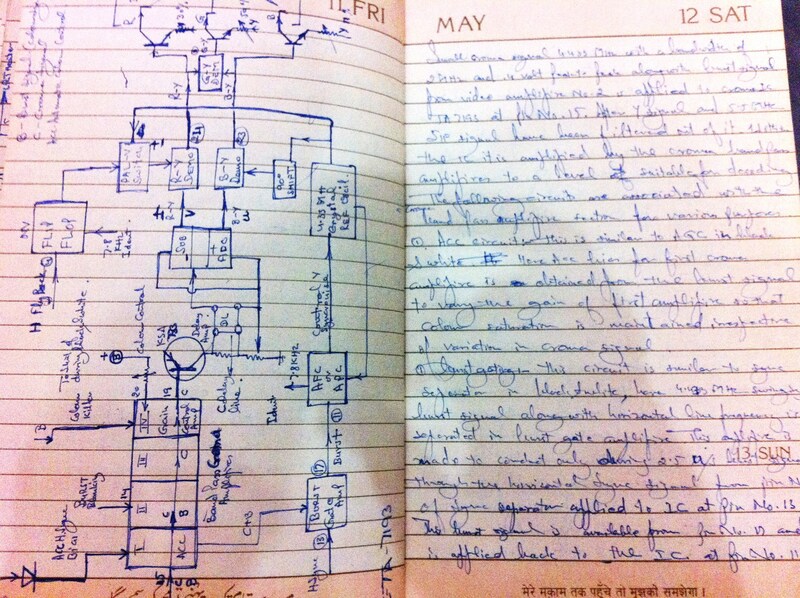 Although I don’t like transistor circuits (I had a disturbing time understanding them during my M.Sc), I like the way he has made notes. Thanks DFSK. 🙂 I think it touched everyone because deep down we are all alike. Thanks Sreetama. 🙂 Yes, it is strange how so many old memories are packed away. They are living with us and neglected in a corner. And then one fine day, it is time to move and we unearth them yet again. first let me tell you, you are a lovely brother, you drew so many models for her to play and stitched barbie hair.. super.. i too have a box filled with all greeting cards and my sketches.. of course old dairies, at times it is embarrassing to re-read the dairy too… but great memories to be cherished..
Heart warming post.. your dad does look like rakesh roshan.. Your post resonates with me. Our home, over time takes on two roles. a haven of peace after a hard day’s work and a repository of our life memories.Imagine if our homes had the capability of playing back our life’s moments to us when we asked it to? Yes, that would be very interesting if the house plays back our memories, although I would prefer to see only the good ones. Oh you are a very good brother! You sister is lucky! 🙂 And guess what even I have a photo of my mom in a similar outfit. 😀 It’s back in India, will put it up someday. This is such a lovely post. Thank you for making me smile and sending me on my own nostalgic trip! Yes, Yes. Do put up that picture. Thanks for liking the post Maddie. What a post Amit ji!! I still like a few of the contestants, so I think the sketches are alright. You made all those beautiful – 200 beautiful pictures and put cardboard strips for them to stand!!! How she must have loved them! Thanks IHM. 🙂 Yeah, she liked them a lot. She played with them for many months. wow! you really made those 200 pictures! First time here on your blog 🙂 I can imagine how it must feel to leave the house where you have stayed for 25 yrs. My current house is where we have been living in for some 15-16 yrs. I cannot imagine leaving it! My Dad too is in a transferable job… so I can relate with your experience! Shifting house, packing, settling down to a new one, new environment…..&$^@&*%$^%$&^@(*#$(&$*(@^%&&% A BIG TASK!!! but still I Love it! Yes, I have seen all those magazines in my house. I think it started with Sarita and then mom moved to Grihshobha. I remember staring at pictures of food in one of the summer edition. Your ma looking like an angel is an understatement, she is breathtakingly beautiful. During one spring cleaning of my maiden home years ago, I came across a diary of the household expenses maintained by my parents. Every day had an entry. The yellowed pages were a treasure trove which had many stories while flipping the pages. My sis was a complete bully in her initial years. Imagine a 5 year old beating a 9 year old. Yes, that happened. She sobered up as she grew up. I found some Urdu diaries of my grandfather. I don’t know why I forgot to mention that in the post. What a beautiful post! And, what a sweet brother you are! as always ..this ones a lovely post too…:)….2 special points- anyone would die to have a brother like you…:)…:)…and man…the postcard obsession!! !….i had collected so many postcards of DDLJ and HAHK…those were the days…:)…wonderful!!…. Now that I look back, the postcard mania makes absolutely no sense. I don’t know why I did that. Amit, you are making me extremely jealous of your sister. You were/are such a sweetheart. And those 200 pictures you drew for her are meant to be treasured for life. What beautiful trip down nostalgia lane. Absolutely loved it! We had our share of fights and hair pulling. It was only after I left for hostel that we sobered up and started behaving like humans. I had no idea mom has kept those pictures. I was surprised to find them. I did not even remember that I colored the pictures. It was such a long time back. Thank you for liking the post Smita. Your old house is demolished? That is so terrible. I cant imagine what you must have felt on seeing it turned into rubble. Thanks for liking the post Jitendra and this beautiful comment.